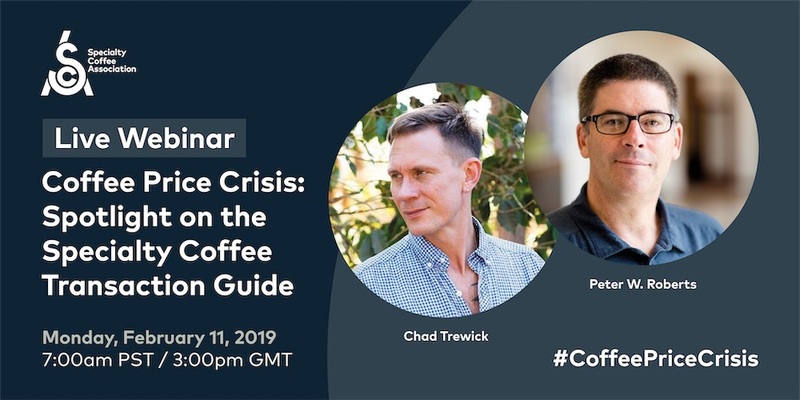 MILAN – The Specialty Coffee Association is holding on February 11 the first in a series of webinars hosted by the SCA’s Coffee Price Crisis Response Initiative. Professor Peter W. Roberts of Emory University and Chad Trewick of Reciprocafé will speak to Ellie Hudson of the SCA about the Specialty Coffee Transaction Guide, launched in December. Click here to learn more about the initiative and to find additional resources. Over the coming months, the SCA will host a series of webinars and events to amplify the work being done in this field by individuals in the private sector, academia, producing countries, and others in the coffee community. In the first webinar in this series, Peter and Chad will present and answer questions about the Specialty Coffee Transaction Guide, a project run by researchers at Emory University that relies on an expanding group of data donors – roasters, importers, exporters, and others – who provide detailed contract data covering specialty coffee transactions from recent harvests. Using this anonymized information, the Transaction Guide serves as a report on the distributions of recent Free on Board (FOB) prices— prices paid for coffees that are delivered and placed onto the ship at the port in the country of embarkation— for green specialty coffees. Download the guide on their website and register to join this webinar.